I'll try to post more later, but here's a tiny bit about the first day at ECCC. 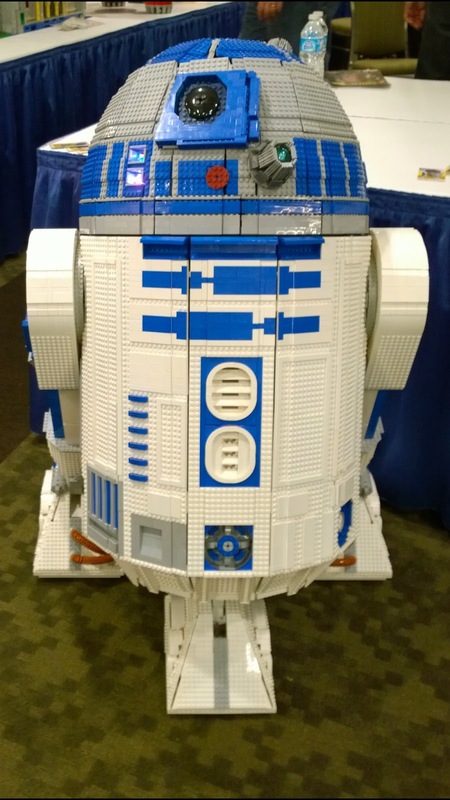 Everyone loved the full size Lego R2-D2. 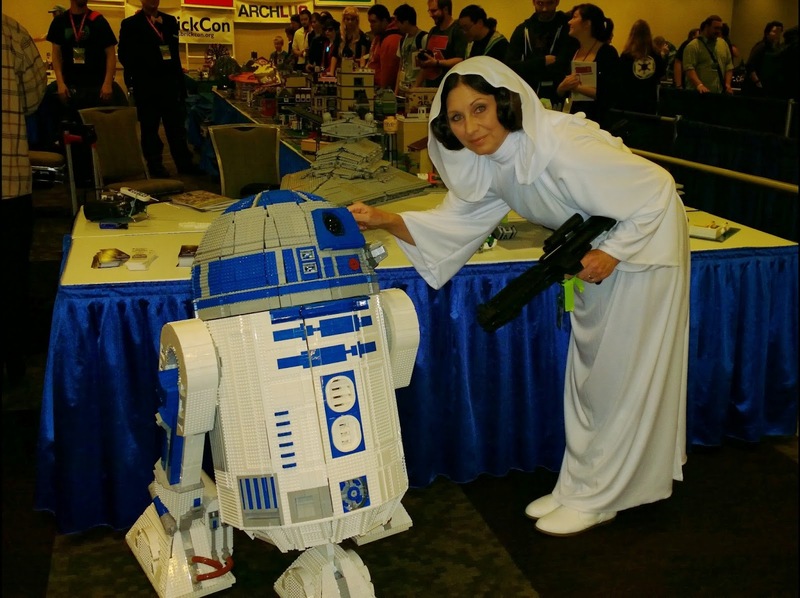 Asking wonderful things like "do you know about the R2-D2 Builder's Club? (yes) And then L3-G0 would beep and they'd go "oh, he makes sound too!" When they started to turn away I'd drive him out and run around the show floor and they'd say "No way, he moves?!?!?!" L3-G0 was supposed to get set up﻿ yesterday, but the skirt took too long to get behaving. I blogged about what he looked like yesterday morning. That required 3D printing some bricks and stuff, but I still had time. Unfortunately the skirt's on the bottom, so he had to be upside down with the legs & feet off to work on the skirt. Above the shoulders, I'd fixed a gap that was missing last time, he hadn't had that before, so I didn't know it'd cause clearance issues. Because of the tightness I'd left out a plate of thickness, about 1/8" and forgot it'd make the sides 1/8" too narrow. The left battery box hadn't been Kragle'd and tried to disassemble itself when sticking it on. Worst, somehow I'd messed up the center caster. I knew the standards 3" caster didn't fit in my Lego shell, but my custom casters failed miserably. But in the trials I found a 3" caster that seemed to work well. I was so fixated on the fore-aft clearance I forgot about sideways, so he couldn't go backwards without the caster jamming or slamming the box to pieces. So I gave up on Thursday. Show didn't open 'til Friday @ 10 so I had time. I used an early prototype and finally got his feet behaving around midnight. Getting to the convention center was tricky. His tie-down is actually really trivial in the minivan. Jam the front casters into the hold-down for the far back seat (after taking out the seat) and throwing a bungee around it. Then, with the dome off (sitting on the rear seat), stick the way-back seatbelts around the center post and let them click into being tight. I'm used to Lego MOCs being fragile and insecure, but L3-G0 travels unbelievably well. Of course that's before putting the fragile shell on it. I thought I could lift it up, but it turned out there wasn't enough room for the bungee, so the shell came off. That wasn't too hard, but I outsmarted myself and it was harder to put back on than I'd expected once I got to the convention center. Once there, the fans loved him. One seems to have found the droid they were looking for! L3-G0 worked really well. On the previous trials parts fell off and there were other small problems, like when the shoulder broke. But he was really reliable. Unfortunately the battery died before lunch, and I let it get really low, so it wouldn't fast-charge. Fortunately I found a motorcycle shop that had another. Alternating two seemed to work fine later in the day (though it's annoying to swap), but we'll see tomorrow. The worst part was the prodding of the fans. They liked to poke. And many wanted pictures with their hand resting on the top of his head. Which is the most fragile part, so his head was dented a few times. And he had an accident with his front foot, but for the most part L3-G0 was strong and ran well. At the end of the day the sprockets on the bolts I'm using for axles started slipping :( The best I can do is probably tighten the set screws in the morning and cross my fingers, but I think it'll be OK. And maybe slow down the acceleration curve a bit. It looks like the rest of the stuff I did to tighten up the wheels worked OK though, so it should be solvable. Gotta get over to the R2-D2 Builder's Club folks sometime, which should be tricky as they're in the other building, and worse, on the other side of the trade floor. The alternate route crosses the street and L3-G0 hates pavement (way, way, way too bumpy). Need sleep, two nights up way too late.